Email marketing is needed because we send and receive emails everyday, even with the invent of new technologies and social network platforms. Email has become part of our daily life and we are dependent on it. 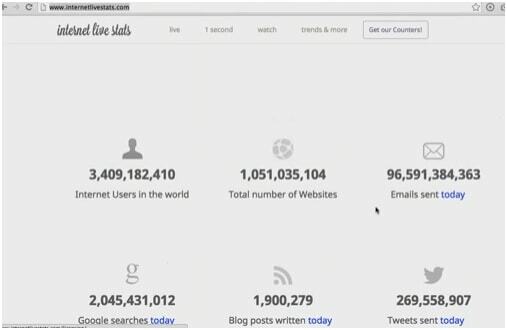 As we see below in the internet live stats, approximately,96 billion emails are sent everyday. Generic Free email services like gmail, yahoo, hotmail etc… have limitations sending mails in a day. For example, gmail allow us to send max 150 emails in a day( 25 emails/hr). Even corporate email services have similar limitations ex: 250 emails/day. So how to send more than 150 emails in a day , say 1 lac emails or more…, ? we need to sign up with Email Marketing service providers for bulk emailing. But why do free email service providers keep limitations on sending emails? Because, spamsters / fraudsters were misusing the free email services in sending bulk unsolicited emails to unknown people/unrelated people, which resulted in the limitations. Also, marketing companies, were sending bulk emails to non-subscribers or non-opt-in people, which resulted in crowded inbox, and users were missing on important emails as they could not easily locate useful and important mails. So limitations were put in place by free email service providers. To keep check on spamsters and marketers to prevent unsolicited emails and misuse of bulk emailing, several developed countries have framed Email marketing rules and regulations. CAN-SPAM Act of 2003 by US, is an important law enforced and followed by several countries in general. It also set standards for sending commercial emails by marketers.In India, there are no specific email marketing laws. Fines are levied on non complaint firms, indulging in bulk emailing violating the CAN-SPAM Act. For email marketing, i.e for sending bulk emails, we need to sign up with Email marketing service providers(ESP) like Mailchimp, Aweber, Campaign Monitor, Constant Contact, Madmimi etc…, who have the necessary infrastructure to do bulk emailing.Big companies can also have their own email servers for bulk emailing. Some ESPs offer free email service for limited subscriber base,while all ESPs offer paid services,based on the no of subscribers you have. sending more than 150 emails/day , if using generic free email services. What are the Email authentication mechanisms? Even gmail, yahoo etc.. are now following the authentication mechanisms strictly. So you can’t send bulk emails from these email ids now. You need to have your own authenticated domain for sending bulk emails.Else all your emails will go to spam folder. What precautions should one take when using Services of Email Marketing Service Providers or email marketing companies? check your email database and remove invalid email ids.